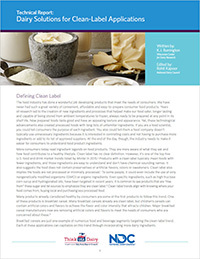 Clean label is among the top trends expected in 2016. Consumers want to see shorter, easy-to-understand ingredient lists before purchasing foods and beverages. Dairy ingredients can serve as a substitute for many unwanted ingredients in a variety of food applications to achieve a more natural product.